Hedda Tessman, nee Gabler, is a headstrong woman. She knows what she wants and knows how to get it. The Ibsen classic is regarded for an assortment of reasons, one of which being the great character of Hedda. It’s no wonder why someone would want to adapt it. 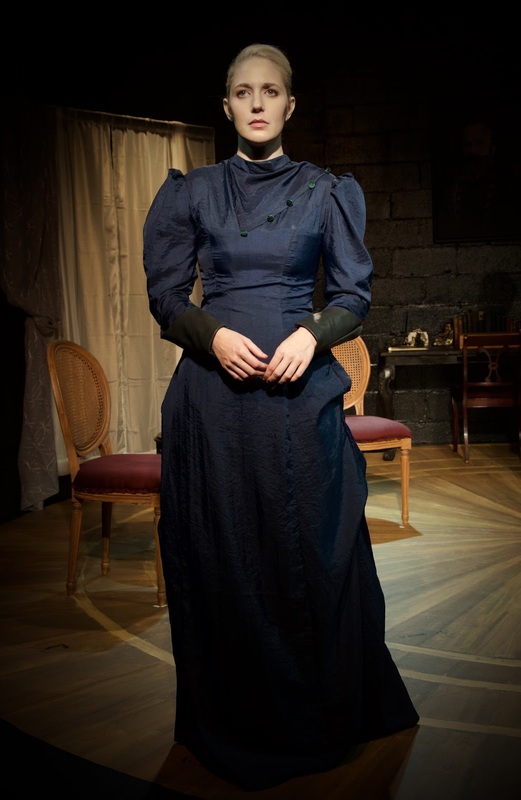 Written by Matt Minnicino’s Hedda (Gabler), Wandering Bark Theatre’ Company’s production is a biting drama that brings modern sensibility to the piece. With a hint of self-referential humor, Matt Minnicino's Hedda still packs the classic drama into this streamlined production. Layered with a more modern tongue, Hedda (Gabler) still follows the downfall of the titular anti-hero. Minnicino keeps the plot the same, never deviating from Ibsen’s story. There may be some erroneous references and jokes for joke sake, Hedda (Gabler) is an honest adaptation the sheds a light onto the wonder that is Hedda and her manipulative ways. Director Joseph Mitchell Parks keeps the piece moving and riveting. The prime focus was on the various relationships. Whether it be marital, familiar, or friendship, Parks kept the connections tight. While we were not granted insight to class or status visually, Parks ensured to hit those notes in the text to elevate the added struggles Hedda and George found themselves in. When it came to the visual of the world of the play, both scenic designer David McQuillen Robertson and costume designer Jason Frey gave a subtle modern flair to their respective design. There scenic pieces were limited but the focus was on the beautiful circular design on the floor. But if we’re being a bit picky, it visually wanted to come downstage a tad so the back wall didn’t eat it up. The black box occasionally ate Frey’s dark costumes but Hedda’s power blue dress managed to defy the darkness. The classically modern score from sound designer Kevin Novinsky paired strikingly with Brad Landers’ choreography in the various movement bits. Landers did a phenomenal job through the storytelling. McQuillen Robertson kept the lighting simple but amped up the color in Landers’ pieces. It all worked well together. Hedda is a woman fond of illicit affairs. She’s a woman wound up in desires. Yet she’s a fascination to watch. Valerie Redd was a dynamic Hedda. There seemed to be a tinge of Iago in her Hedda. It helped to make her downfall so much more glorious. Quinn Franzen had a Gatsby-esque charm as Eilert Lovborg. Franzen married the slightly heightened text with the modern cadence best. While his recovery was a bit understated, he was someone to cheer for. As George Tesman, Kyle Schaefer allowed his George to constantly be dominated by Redd’s Hedda. He was a spineless character. It helped to define the loveless marriage. Susanna Stahlmann as Thea seemed to be in a different version of Hedda Gabler. Stahlmann had a flair for the classic but that was not this production. She consistently played the hysterics, causing a bit of a one-note performance. If you’re a fan of Henrik Ibsen or Hedda Gabler, Wandering Bark did a strong job paying homage to the play while still putting their own twist on the classic. And for those who hate sitting through the standard piece, this ninety-minute version is fast and gritty.